Whilst customers share the requirement for maximum visual impact, outstanding graphics, and value for money… they have many different needs in terms of quality, durability, flexibility, lifespan, usage… and of course budget. To help customers get the banners they want Synergy has developed a portfolio of Banners/Flags and Bases to meet these needs. We have 3 main Ranges (Professional, Value and Budget Series) and within these numerous sizes and specifications of banners; different shapes i.e. 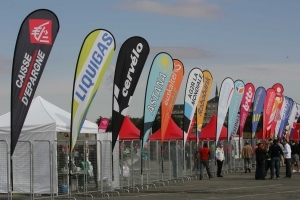 Flying, Feather, Wing, Teardrop, D-flag Banners, different options; Single or Double Sided, extended poles, and many Bases, mounting and fixing hardware solutions through to full flagpole systems which all provides you with options to better suit your needs. Please note when comparing banners the actual height sizes vs. size descriptions (i.e. Small, Medium & Large) can vary between ranges. Expand a Sign Professional Banners are made to last and are not supposed to be readily disposable like so many inferior products on the market today. Banners are high resolution dye sublimation printed digital full color single or true double sided onto Expand a Sign’s own flame retardant material with a block-out backing to prevent show-through. Our fiberglass and steel hardware is durable and can be re-used for multiple indoor and outdoor promotions and events. This means you can install them at different events, year after year, so less hassle for you and more long-term savings. A value Banner range for short-term usage with a high quality die-sub printed single sided image, banners finished with a woven band. Single sided with a range of “friction” fitting mounts available. The ideal lightweight and light duty BEAT THE budget Banner range for short-term usage with a high quality die-sub printed knit fabric single sided image, banner without band. Single sided with a range of “friction” fitting mounts available. Counterfeit goods put public safety at risk. By their very nature, fake goods are produced very cheaply and are not subject to the rigorous testing procedures that reputable manufacturers are required to carry out on their products. Expand a Sign is the home of the original Flying Banner. We developed, designed and patented this unique product so you don’t have to worry about it.